A couple of weeks ago, we shared some tips for running in cold weather. Back then, the freezing temps were not stopping us from hitting the road, but recently the cold weather and the icy roads convinced us to move our workout to the treadmill. We bet some of you are already doing your runs indoors, so we decided this would be the perfect timing to share some tips to make your treadmill running more effective, enjoyable, and safe! 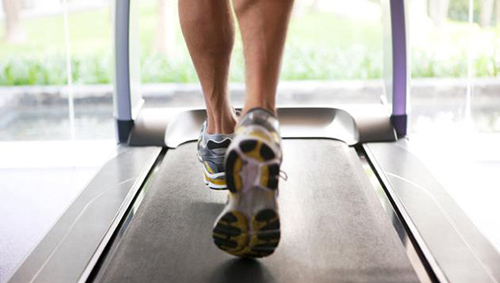 Remember: you can still use your Bluefin apps when you’re working out on the treadmill! Because the temps indoors are higher, you’re likely to sweat a lot on the treadmill. Keep a towel handy, consider wearing lighter training clothes – such as a well-fitted technical T-shirt and a quality pair of shorts – and a sweatband or wristbands to catch excess sweat. Even though the treadmill belt is a softer running surface, you can wear your regular running shoes, as long as they are clean. But you might be more comfortable wearing lighter, less cushioned footwear. When you’re running on the treadmill there’s little air resistance to help to keep you cool. Therefore, you can lose more water running on a treadmill then you would if you were running outdoors. To maintain good hydration levels, keep within your reach an easy to use waterbottle that you can operate with just one hand. It’s very tempting to just jump on the treadmill and start working out at your set pace. But you should allow time for a warm up to help make your workout as safe and effective as possible. To warm up right, walk or run at a slow, easy pace for 5-10 minutes. Running on a flat treadmill (incline at 0%) is very similar to running down a slight decline on the open road. Since there’s no air resistance while running indoors, you should set the treadmill inclination to 1 – 2% to better simulate outdoor running. But if you want to challenge yourself by increasing your base incline amount, avoid setting the incline to more than 7% – this may lead to Achilles tendon or calf injuries – and running at an incline of more than 2% for your entire run. When running on the treadmill, try to maintain the posture you would have if you were running outside, by keeping your arms away from the handrail or console and at a 90 degree angle. Also, the treadmill tends to pull your feet backward, so you’ll need to pull your feet from the belt before they are driven away in order to keep your body upright. Paying attention to your stride will help you to minimize the impact transferred to your legs and run more efficiently. In fact, elite runners can run about 180 steps per minute. It’s very easy to determine your stride count. Just count how often one foot hits the belt in a minute and then double that number.To improve your stride count during your run, keep your stride quick and short, and your feet close to the belt. As it is tempting to skip the warm up, it’s also easy to hop off the treadmill when your workout is done. But if you want to prevent dizziness or the feeling that you’re still moving when you step off the treadmill, you should allow about 5 minutes to cool down. Before you get off the treadmill, do a slow jog or walk at the end of your run to allow your heart rate to go below 100 bpm. Did you also stop running outdoors and start running on the treadmill? How did it affect your training plans?